Learn to give your brain some downtime. Many of us worry about the future or dwell upon the past. Our mind is constantly in turmoil. Almost all meditation techniques talk about focusing one's attention on an object (for example, a mantra). By focusing one's attention, the goal is to give oneself a break from mind-wandering. This break from mind-wandering, during meditation, gives our brain some "downtime". In this program, Dr. Manish Saggar, Asst. 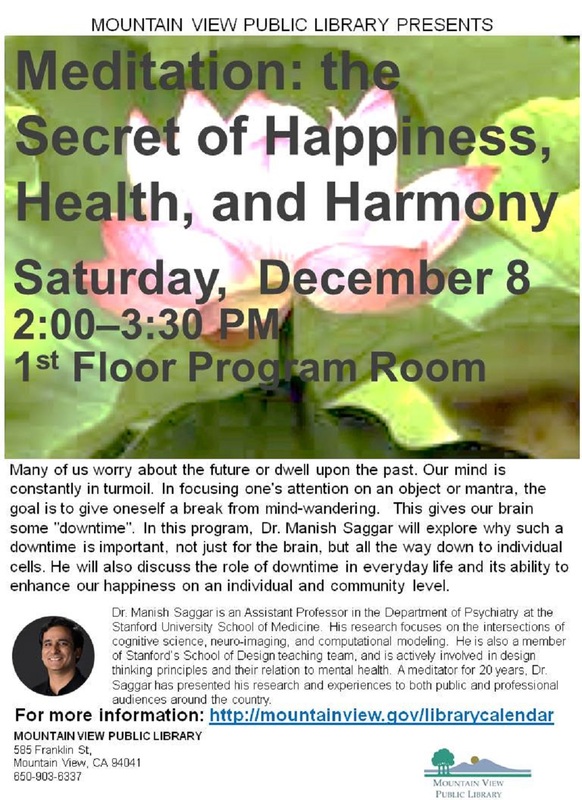 Professor of Psychiatry, Stanford University School of Medicine and long-time meditator, will explore why such a downtime is important not just for the brain, but all the way down to individual cells. He will also discuss the role of downtime in everyday life and its ability to enhance our happiness on an individual and community level.